Since yesterday I gave you a full color version of the paper doll, I thought today I'd actually let you color your own. Today's Paper Doll is all in black and white, and she comes with two brand new outfits that will fit her colorful twin sister from yesterday's post. The first outfit is a ballet costume, complete with sequins, a sweetheart neckline, a tutu, tights, and ballet slippers. The second is a bit warmer, with a double breasted coat, jeans, and a pair of sneakers. 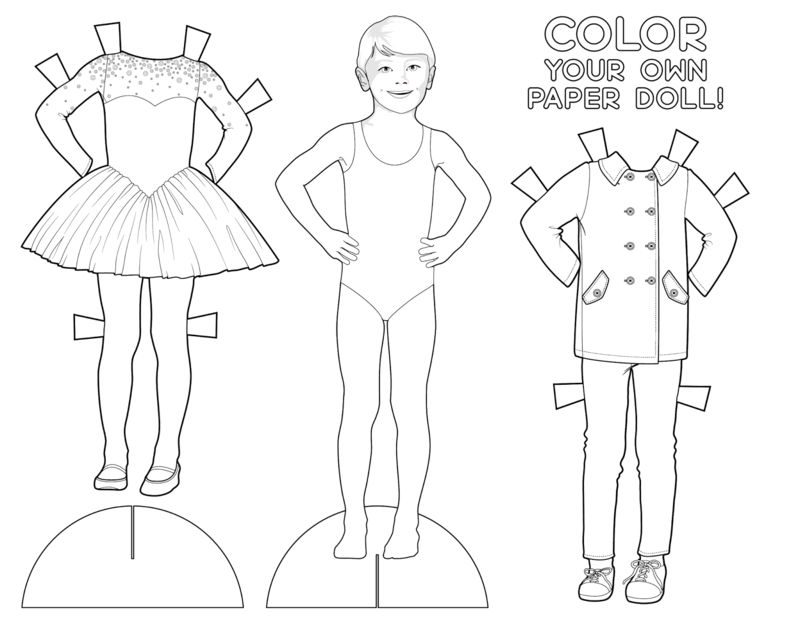 This paper doll page can easily be printed out on 8.5" x 11" Paper, and if you've printed out the one from Wednesday's post, you've now got four whole outfits! When coloring your paper doll and her outfits, remember: you don't have to just use solid colors. What about a polka dotted coat or some floral jeans? Perhaps her one piece swim suit has some stripes or hearts! You could even get really fancy and add some glitter, puff paint, rhinestones, or sequins! Once you've finished with your designs, don't forget to share on The Spinsterhood Diaries' Facebook Page or on Instagram! I can't wait to see what you create!